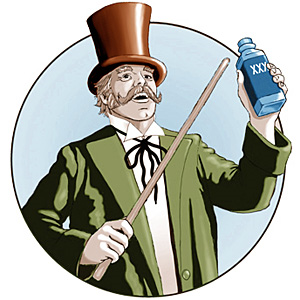 The phrase “snake oil”, gets bandied about most frequently in the tech world it seems to me, when it comes to two classes of applications – Registry Cleaners, and Memory Managers. In both cases, I’ll concede that it’s probably a fair description. But, (there’s that “but” again), in some cases, the use of an aggressive Registry Cleaner such as RegSeeker may be called for, and, there are a number of Memory Managers that can improve system response given the right parameters. Yes, I’ve heard all the naysayers and their arguments that memory management and optimization applications, are not effective. I don’t necessarily agree. Sure, if you have 2/3/4, GB of Ram you don’t need to manage your memory in this way. However, a fair number of users that I deal with on a personal level, run Windows XP on a 3 or 4 year old box, with 1 GB of RAM or less – they do not run Windows 7 with 2/3/4 GB of Ram. This is “real world” computing, not the “esoteric world” of computing that many techies live in, where the assumption seems to be, all users run a quad core with appropriate memory. It just ain’t so! This review is based on years of experience with this application, and not a ten minute “let’s see what you can do” test, as is far too often the case with software reviews. On this site, nothing gets written up without a minimum two week, or longer, test period. One of my test platforms is an older Dell running Windows XP Pro with 512 MB of RAM, which gets a heavy workout on a daily basis, and has for years. And, the free Memory Manager, FreeRAM XP Pro, has been an integral part of this system for most of that time, and has worked flawlessly in balancing and releasing memory as required. FreeRAM XP Pro includes automatic memory monitoring and optimization, advanced tray support, fast, threaded freeing with a stop option, multiple system-metric monitors, a simple and attractive GUI, memory reporting and diagnostic logging, and real-time memory information. The program’s AutoFree feature intelligently scales how much RAM is freed with your current system status, so that RAM is optimized without slowing down your computer. FreeRAM XP Pro has been designed to be easy to use, yet highly customizable by computer novices and experts alike. System requirements: Windows 2000, XP. Another view: After a previous review of this application, several years ago, the following comment was made by a reader. To illustrate the conflicting views surrounding Memory Managers, I’ve copied that comment here. XP and Vista have excellent memory management and there is no need or benefit in external memory “managers”. What problems there might be can not be corrected by any external program. DLL’s are not unloaded from RAM when no longer needed – by design. Program code will not be unloaded when the application terminates – by design. This is what caching is all about. Caching has had a long and distinguished history and it is highly developed in XP, even better in Vista. When then RAM used by caching is needed for other purposes it will be released. At all times Windows will attempt to find some use for as much memory as possible, even if it is only of trivial importance. Unused memory is wasted memory. If memory is needed for more important uses it will be made available. Until that times comes it will be left in use, improving overall system performance. Bottom Line: Let Windows memory management do it’s job. It knows what it is doing, even when we do not understand. In years gone by, I used apps like this. Now that I keep my machine nice and lean, I find I don’t need to use them. My box is about 5 years old, 1 gig of ram, and it runs like new most times. Regular cleanups using Regseeker, Glary and CCleaner help too. Plus top notch security programs which are light on resources. Your setup is just the type of system I see virtually all the time. Glad you mentioned Regseeker. As you know, in the right hands it’s a powerhouse. I thought this would be a good segway to installing Linux! Great suggestion – I really do need to get that Linux experience article up since I’ve now been running Ubuntu for 6 months, virtually full-time. I have an old Toughbook with a 1GHZ P3 and a maximum of 512 ram. Since I keep it simple and only use Opera and Office it actually boots and runs pretty decently. But maybe this is worth a go? Yeah, that’s the one you throw in the back of the truck, right? That old Dell is still clicking away after all these years – mind you, I keep it sparkling clean (modules, CPU, fans, etc.). Over the years I’ve come to rely on FreeRAM – it really does exactly as advertised on that machine. Many years ago, I did try out one of these memory managers (sorry, I can’t remember the name any longer) because my computer seemed to be slowing down. Not only did it not help, the whole system slowed to a dead crawl. I suspect that the memory manager started to page memory out to the hard-disk and this slowed down the computer tremendously (I could actually hear the hard-disk thrashing away and the hard-disk light furiously flickering almost non-stop). I immediately uninstalled the program and things returned to the slow but not dead slow speed. Things may have improved over the years but I think these programs should be approached with caution. Yes, you’re right. This type of application has a history of performing just as you describe. Your advice to use caution is well founded. Having said that, FreeRam XP continues to perform well on my old system.